If you are struggling to finance your counselling therapy, we have a counselling intern that is under supervision under Ofir Vaisman, our Clinical Director at a rate of $65 per session. Please see Ronaldo’s profile by clicking here. We also have practicum students under experienced supervision at a rate of a suggested $40 per session. We would look at subsidizing this further depending on your life situation (student, low income, retired, addiction, transition, disability, single parent, children and youth, etc.). Current practicum interns include: Karla, Alyssa, Jaclyn, Gayane, Avital, and Dmytri. There may be a wait-list for this program, but we will do our best to get you in to see a counsellor right away. If you are struggling to make even the $40 rate, and still need the support, please 778-288-8361 and discuss your situation. We will not turn anyone in need away and for some that may mean no cost during your difficult life situation. Counselling services provided by doctoral student interns, supervised by registered psychologists. By-donation ($20.00 min) feminist counselling services provided by supervised masters-level and intern narrative therapists. 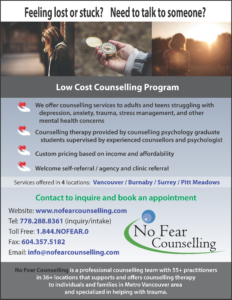 Reduced fee, Individual, couples and family counselling. Secular counselling services provided at the Vancouver Unitarian Centre by supervised volunteers with Masters degrees in psychology or psychology-related fields. Sliding scale individual and couples counselling. Counselling provided by counselling psychology graduate students at the Adler Centre, supervised by an experienced clinician. Counselling fees based on household income. Masters-level therapists. Offices are in Vancouver, Richmond, Burnaby, New Westminster and Surrey.